The proposed works to Clay Pit Lane/Woodhouse Lane Junction have been tabled for the council meeting on Wednesday. 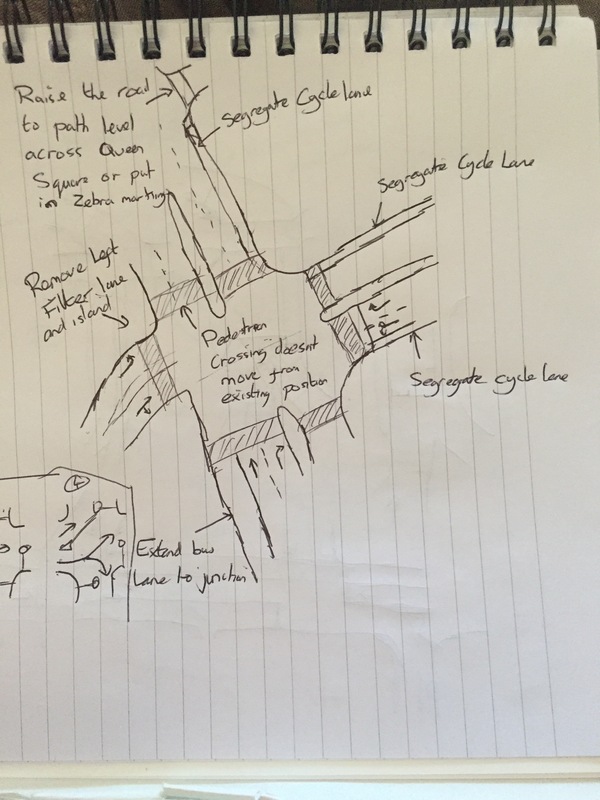 It is pleasing to see work undertaken to review the public realm within Leeds but I feel that with a number of tweaks to the proposed design, this public realm could really improve the experience for users of more sustainable transport modes through this junction. The current proposal for Cookridge Street proposes the retention of the current layout with the easy left turn for northbound traffic and pedestrian island retained. This should be removed. This will save the costs of delivering and maintaining a set of lights and remove a crossing that would act as a further barrier for pedestrians crossing this junction. I advocate that the bus lane is extended to the junction. The reason is that to achieve the step change in bus travel that is being aspired for in Leeds, continuous bus lanes across the inner ring road will need to be installed. This project offers an opportunity to commence the start of works on one of the necessary improvements across the inner ring road affecting three high frequency routes (1, 6 and 56) and 31 buses per hour capable of moving over two thousand people per hour. As only 2-3 vehicles can fit here between the end of the bus lane and the junction, I would urge that this opportunity is taken as part of these works to help improve bus reliability. Potentially an early trial using temporary works to create an extended bus lane here can help identify the improvements to bus services and traffic flows before implementation. A raised pavement here could help change the priority here from vehicles to cyclists and pedestrians helping to spread the public nature of the square up Woodhouse Lane. As there will be no marked pedestrian crossing here, this will be helpful to provide some clear guidance on priority. I would suggest formally segregating the cycle lane here from the existing road surface as it passes the newly created public space. This will make it easier for less confident cyclists to join/leave the traffic flow. I would suggest formally segregating the cycle lanes in both directions here from the existing road surface. This will make it easier for less confident cyclists to join/leave the traffic flow. A raised pavement across the junction with Clay Pit Lane where the pedestrian crossing is located could help reinforce the change in road conditions from a main road to a slower access road.